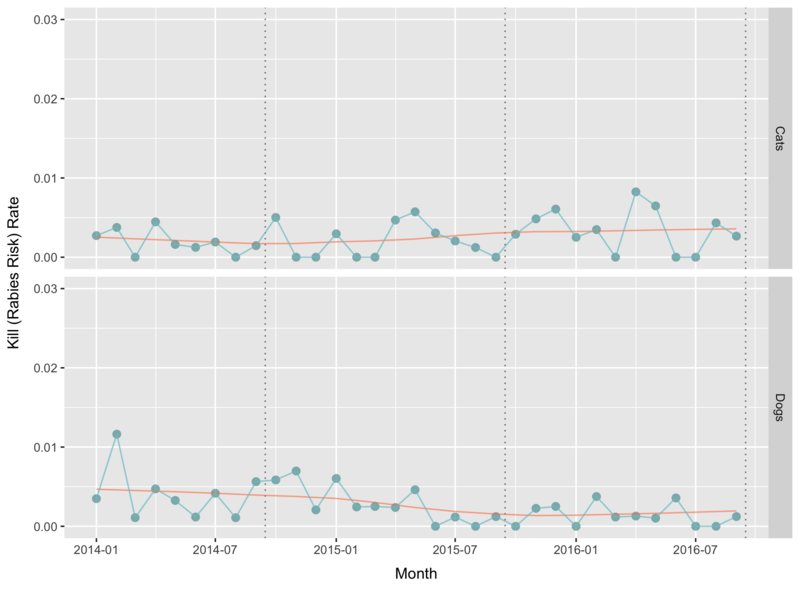 This post is a supplement to the previous series comparing the open data from Austin Animal Center to that from another city shelter. 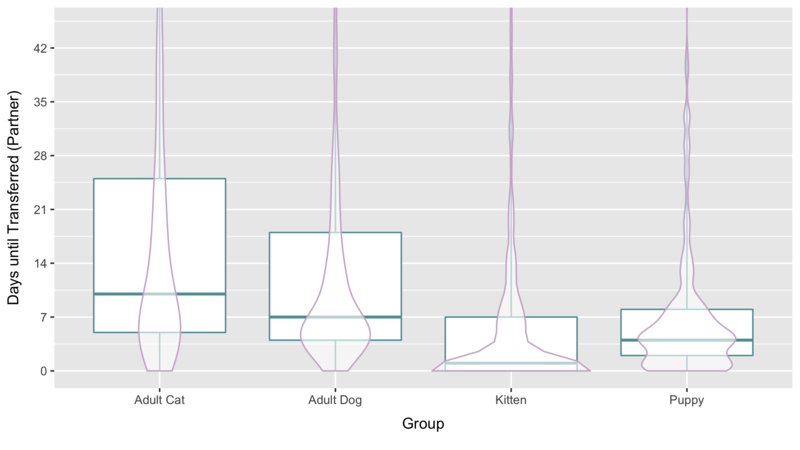 In this post we will look more thoroughly at descriptive statistics for cat and dog outcomes at the Austin Animal Center (AAC) alone. In particular, we will examine how the outcome profile is evolving, by comparing outcomes in the most recent twelve-month cycle with outcomes in the preceding twelve-month cycle. As well, we will consider the current data in light of the fundamental goal of protecting the lives of shelter animals. Nearly half of all cats and dogs were adopted. Less than 3% were killed by lethal injection. Adult dogs and kittens accounted for 70% of the animals flowing through the shelter. Transfer was the most likely outcome for a stray adult cat, whereas adoption was the most likely outcome for a kitten, puppy, adult dog, or owner-surrendered adult cat. Nearly as many adult dogs were redeemed as were adopted. Redemption was much less in all other groups. Impounded dogs are assigned a primary breed label. 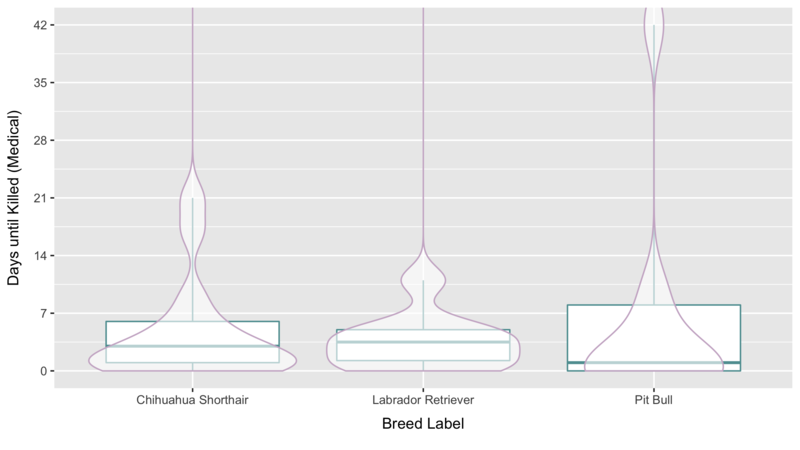 In the recent cycle, the top four breed labels accounted for nearly half of the dogs in the shelter. The other half comprised a long tail of many breed labels, over 300 in all. In the recent cycle, the most likely outcome for adult dogs and puppies with the top breed labels was adoption, except for adult dogs labeled “Pit Bull,” which were slightly more likely to be redeemed by their owners than to be adopted. The Austin Animal Center came under new management in the summer of 2015. Consequently, when we look at the recent cycle compared with the prior cycle, we are also approximately looking at new management compared with old management. 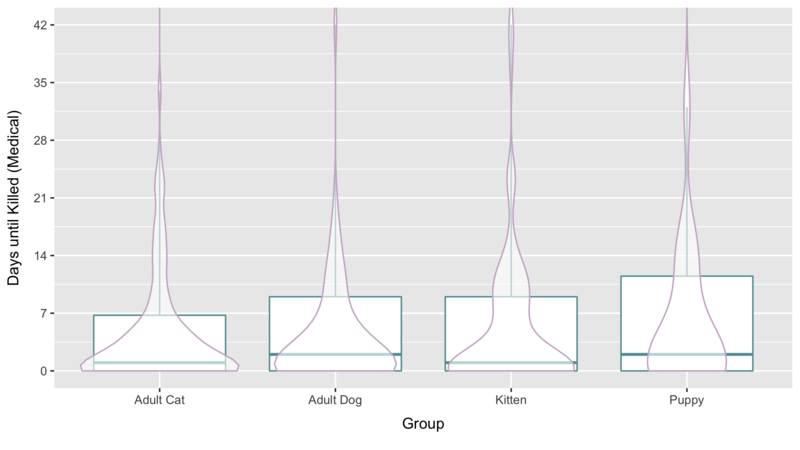 Below are cat and dog outcomes compared across the two cycles. 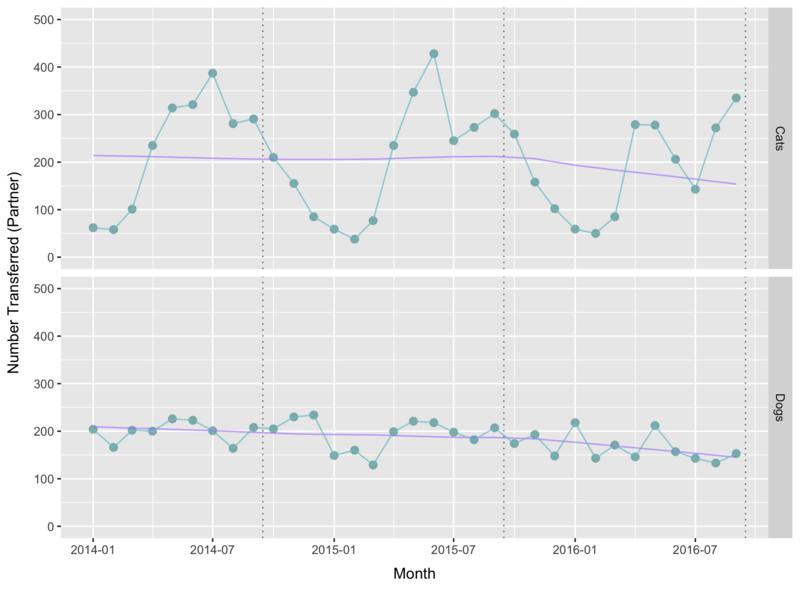 We should keep in mind that the recent cycle had lighter intake than the prior cycle, by about 540 cats and 370 dogs. 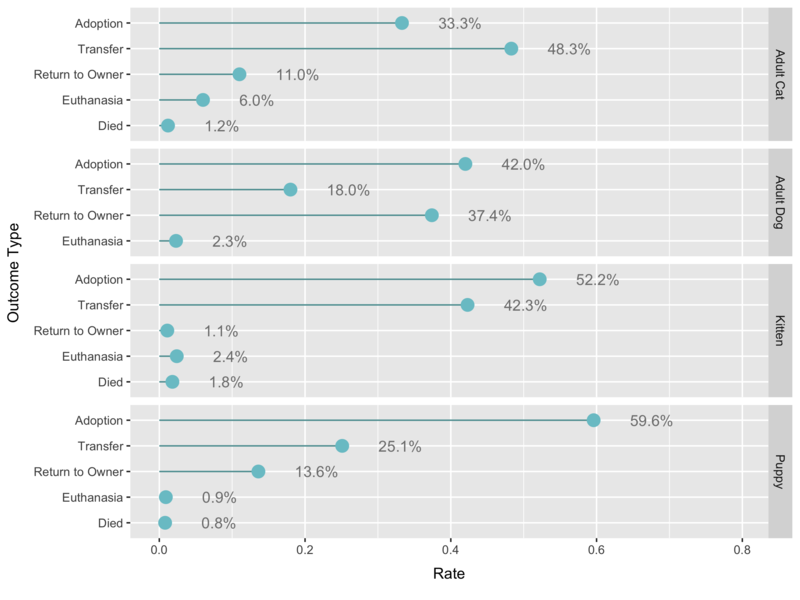 In the recent cycle, cat adoption was up, cat and dog transfer was down, and cat and dog killing was cut in half, the most dramatic change in any outcome type. In the recent cycle, 3,120 cats and 4,670 dogs were adopted, for an overall adoption rate of 46.4%. More cats and adult dogs were adopted than in the prior cycle, and fewer puppies. Kittens made up two thirds of the increased cat adoption. 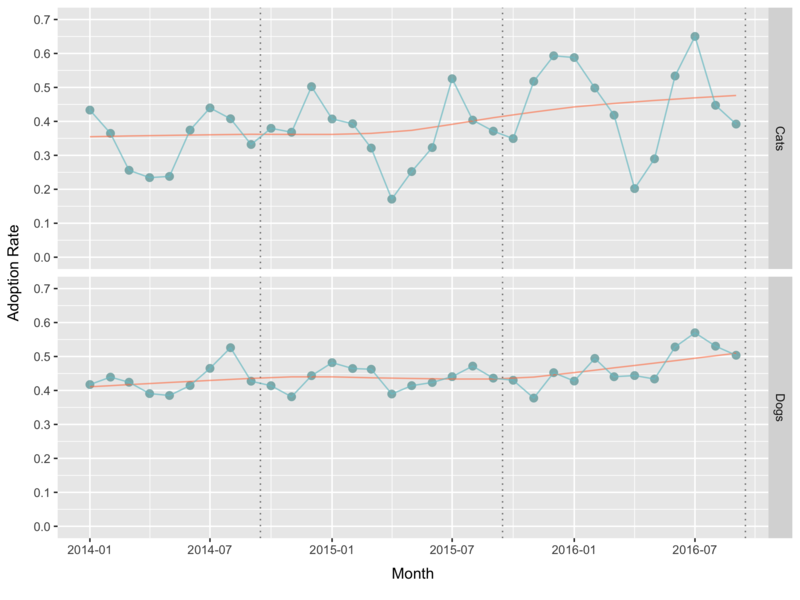 Monthly cat adoption volume is manifestly seasonal and driven by cat intake, peaking at around 500 in summer months and dropping to around 100 in winter. Most all of the seasonal effect comes from kittens. 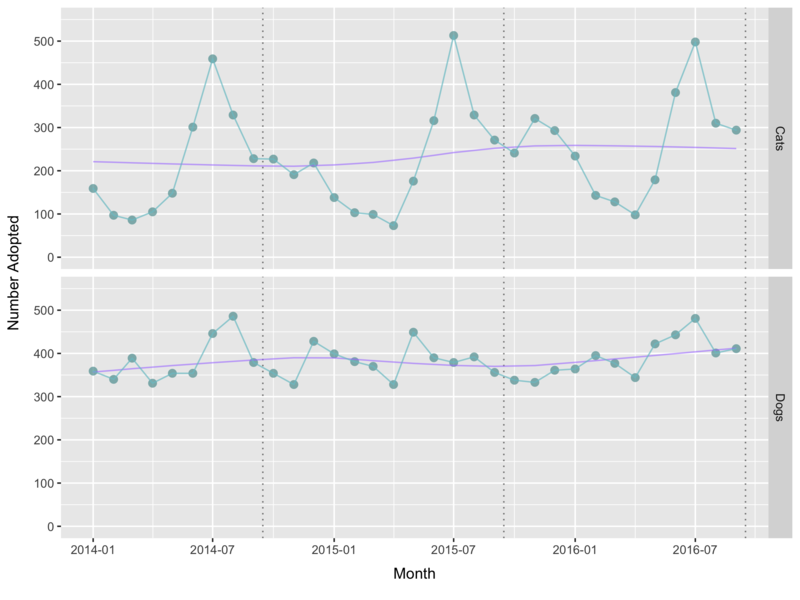 Dog adoption volume averaged 389 dogs per month in the recent cycle. The recent cycle saw nearly 200 more dogs labeled “Pit Bull” adopted than in the prior cycle, a 44% increase, notwithstanding lighter intake. The adoption rate of these dogs jumped from 29% to 41%. The stray-hold period in Austin is three business days. Consequently, adoption on the day of intake and the three following days is mostly limited to owner-relinquished animals. 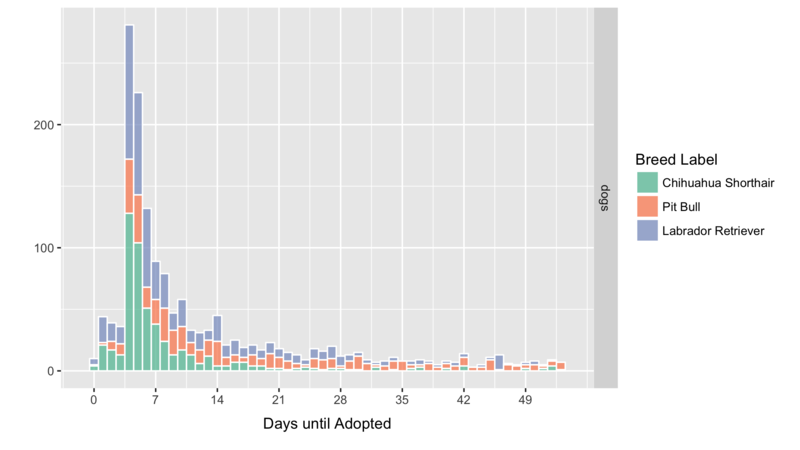 Adoption of strays begins on day four, which is clearly observable in the frequency histograms of days until adoption. 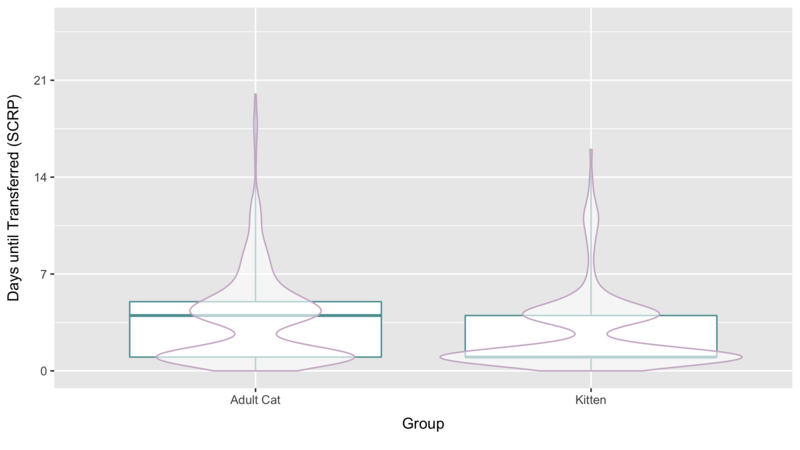 The frequency distribution has a long tail that comprises adult cats, adult dogs, and those kittens that were originally taken in unweaned but after some time and care became ready for a new home. 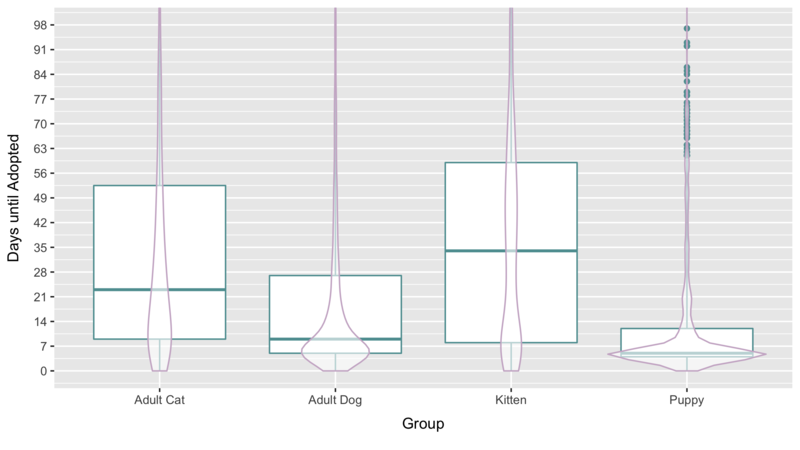 A box plot is another way we can visualize the frequency distribution of the time until adoption. A box plot shows the quartiles of the distribution (the top of the box is 75%, the bottom is 25%, and the dark separator line is the median). 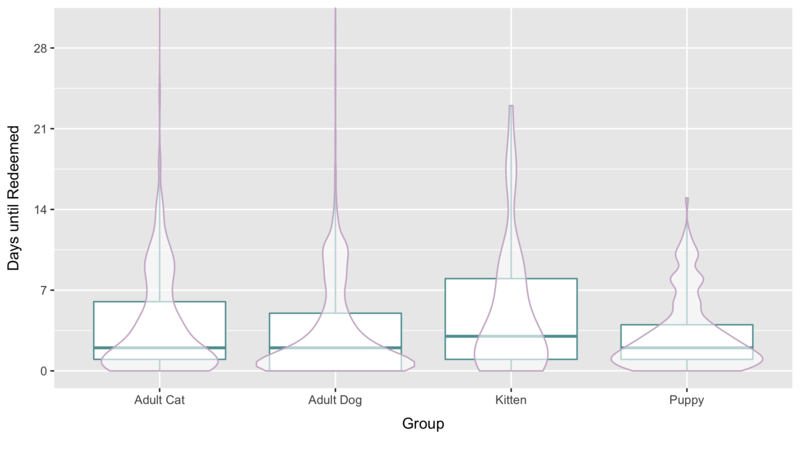 In addition, our box plots are overlaid with the shape of the density curve, which, in this case, shows more precisely how time-until-adoption is distributed. In the recent cycle, the median time until adoption for adult dogs, puppies, and weaned kittens was about one week. For adult cats the median time was about three weeks, and for neonatal kittens, about seven weeks. Adult dogs labeled “Pit Bull” took longer to reach adoption. The median time was one month, whereas the median for other top breed labels was one or two weeks. 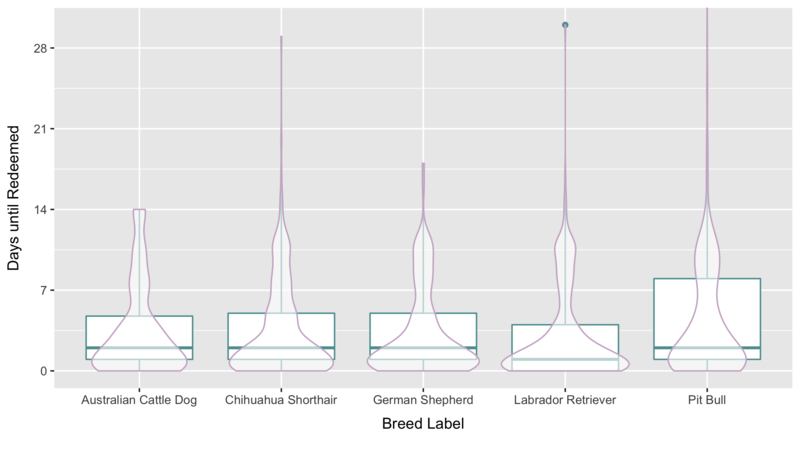 The shape of the distribution was also much flatter, such that it took over two months for three quarters to be adopted, appreciably longer than the other breed labels (e.g., three quarters of all adopted adult dogs labeled “Chihuahua” had departed the shelter within eleven days). 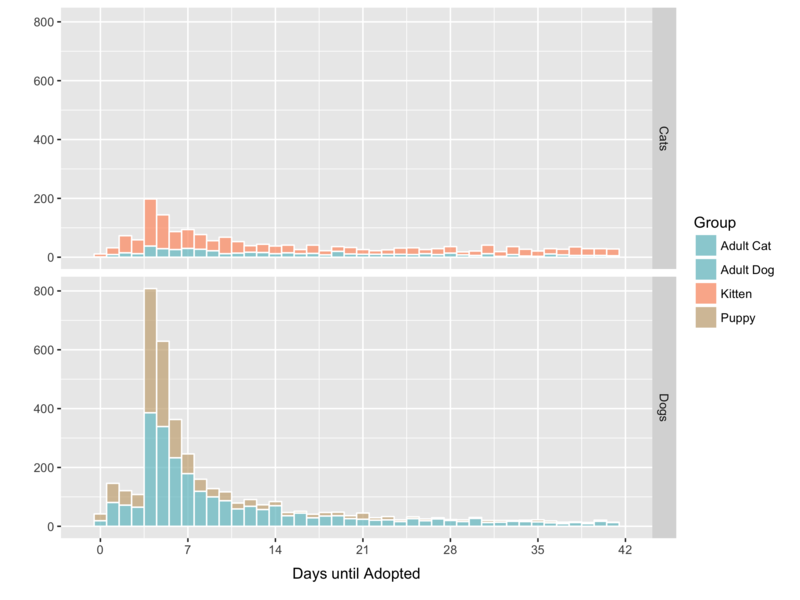 The cats and dogs in the long tail of the distribution deserve further analysis, since understanding what features are predictive of a long wait for a new home might lead to new strategies for accelerating their adoptions. Additionally, research on choice has suggested that too many options can lead to customer demotivation. In high-inventory retail situations, sales associates are responsible for helping customers avoid choice overload. Environments offering fewer choices have been shown to engender higher customer drive and higher subsequent satisfaction with the selection made. When it comes to adoption, dogs that are regularly passed over in the choice-rich environment of the shelter, where hundreds of dogs are on display, may very well benefit from off-site, micro-adoption events where a limited number dogs are present. 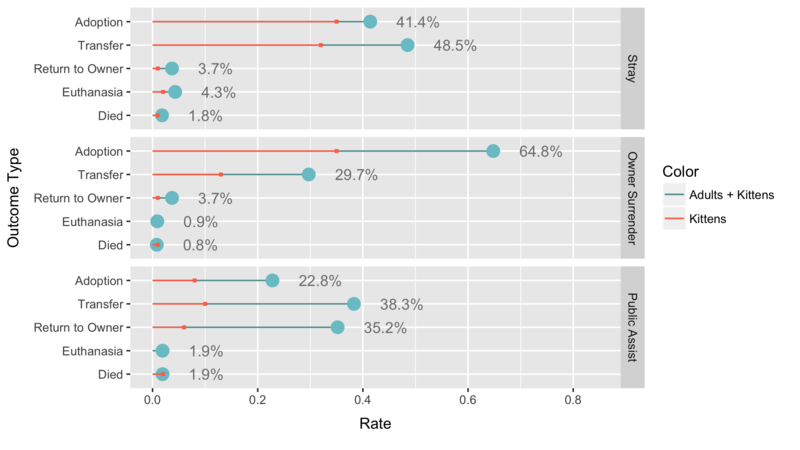 In the recent cycle, 304 cats and 3,083 dogs were redeemed by their owners, for an overall redemption rate of 20.2%, which was marginally higher than the prior cycle’s rate. On average, 25 cats and 257 dogs were redeemed each month. Animal shelters typically have a considerably higher redemption rate for dogs than for cats, and Austin is no exception. Over one third of adult dogs were redeemed, versus a little better than one tenth of adult cats. Dog redemption has a moderate seasonal effect, with more dogs redeemed in early spring. Redemption is most likely to happen soon after a dog or cat arrives at the shelter. In the recent cycle, half of all redemption of cats and dogs occurred in the first two days, and three quarters in the first week. 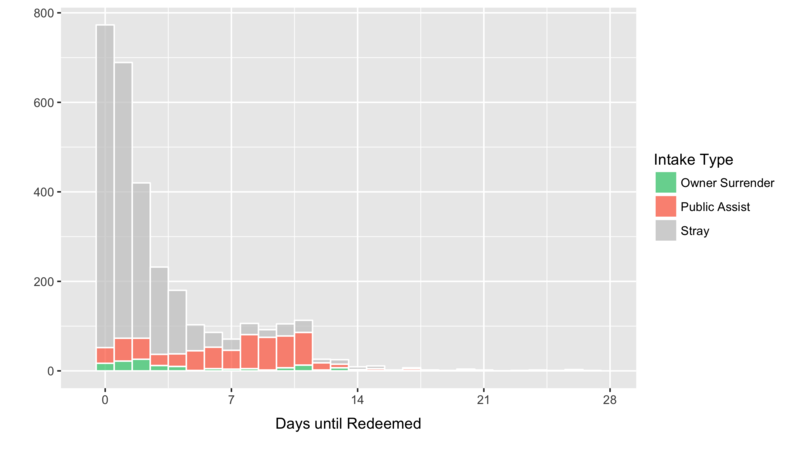 After two weeks there was comparatively little redemption activity. 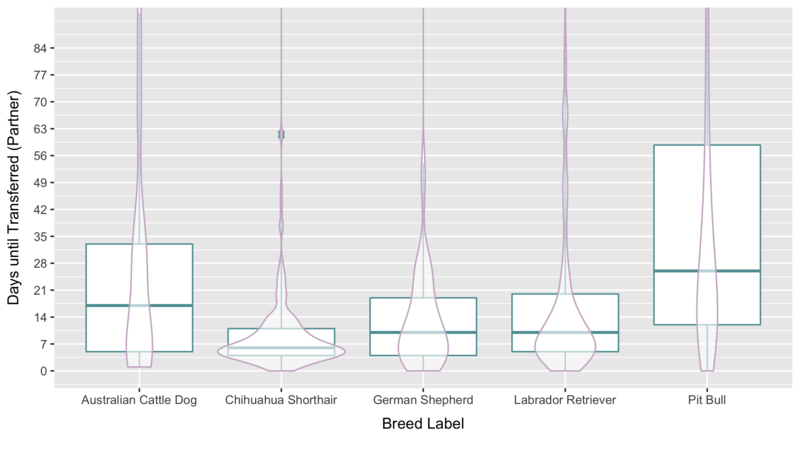 Across the top breed labels for adult dogs there was little difference in the median time to redemption. However, for adult dogs taken in as strays, those labeled “Chihuahua” had a relatively low rate (29%), while those labeled “Pit Bull” had a relatively high rate (41%). Since, as we have already seen, dogs labeled “Chihuahua” were fast to be adopted while dogs labeled “Pit Bull” were slow, there is a hint in the data that sometimes redemption is foreclosed by adoption (or transfer). Therefore, looking further into the features of the “late redeemers,” those dogs whose owners are looking for them but that are reunited after some time has passed, might point to strategies for accelerating redemption of all dogs. 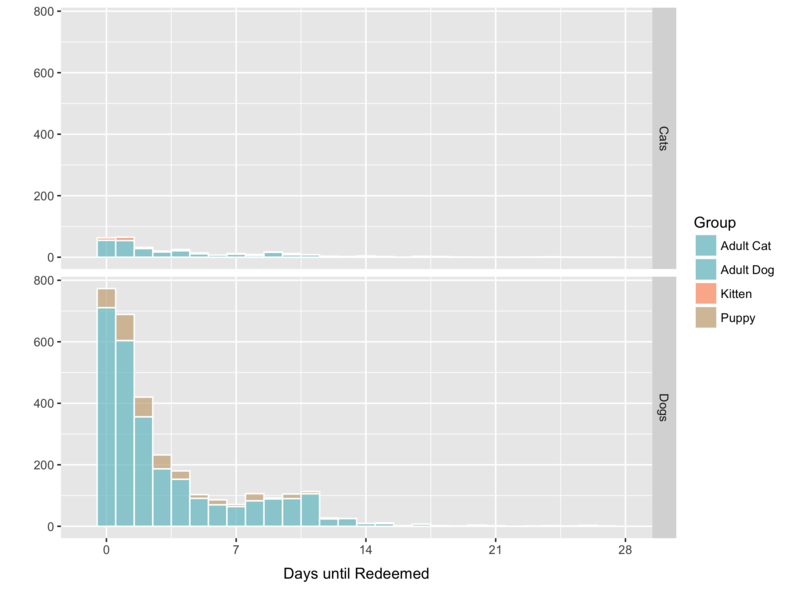 The distribution of time until redemption for dogs was bimodal, with one large peak at day zero and a second smaller peak at about one week out. The first peak was dominated by stray dogs, while the second peak was dominated by dogs taken in as public assistance. 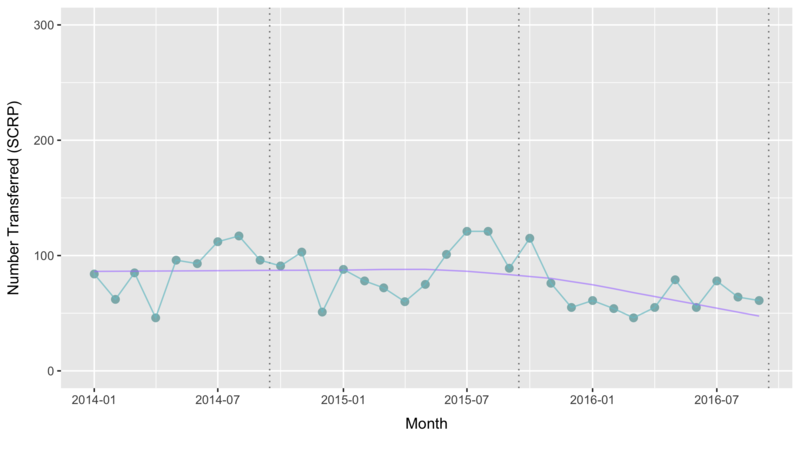 As the histogram suggests, the median time to redemption for public assistance dogs was eight days. Transfers fall into two categories. Most transfers are cats and dogs going to partner organizations. In the recent cycle, 84% of transfers were this kind. The rest are transfers of cats headed for release through the Stray Cat Return Program (SCRP). We will look at each category of transfer separately in the next sections. As summarized above, about half of all adult cats were transferred — one quarter to partner organizations and one quarter to SCRP — making them the most transferred group. The least transferred group was adult dogs, of which 18% were transferred to partner organizations. Austin Animal Center’s primary transfer partner is the local non-profit Austin Pets Alive! In 2015, Austin Pets Alive! reported receiving 3,265 cats and dogs from Austin Animal Center, which was 70% of the cats and dogs that AAC transferred to partner organizations, and 46% of the cats and dogs that Austin Pets! Alive took in. On their web site, Austin Pets Alive! relates that their participation as a partner accounted for 18 points of Austin Animal Center’s 2015 live-release rate. In the recent cycle, 2,226 cats and 1,991 dogs were transferred to partner organizations, for an overall transfer rate of 25.1%. 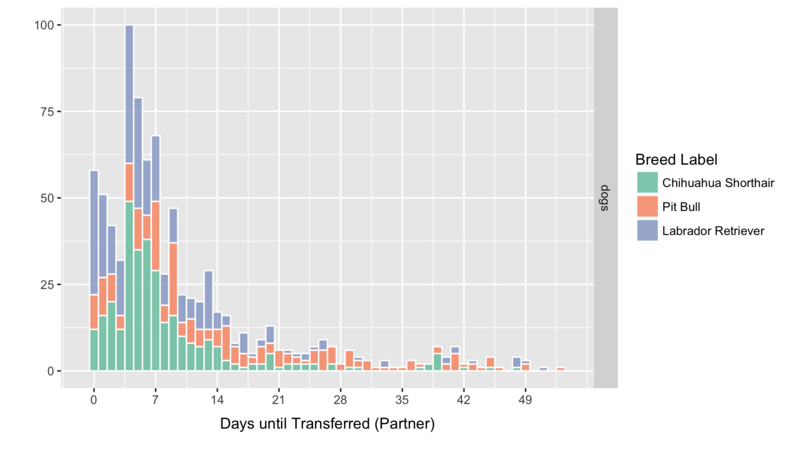 There were fewer transfers to partner organizations than in the prior cycle, particularly for puppies and kittens. 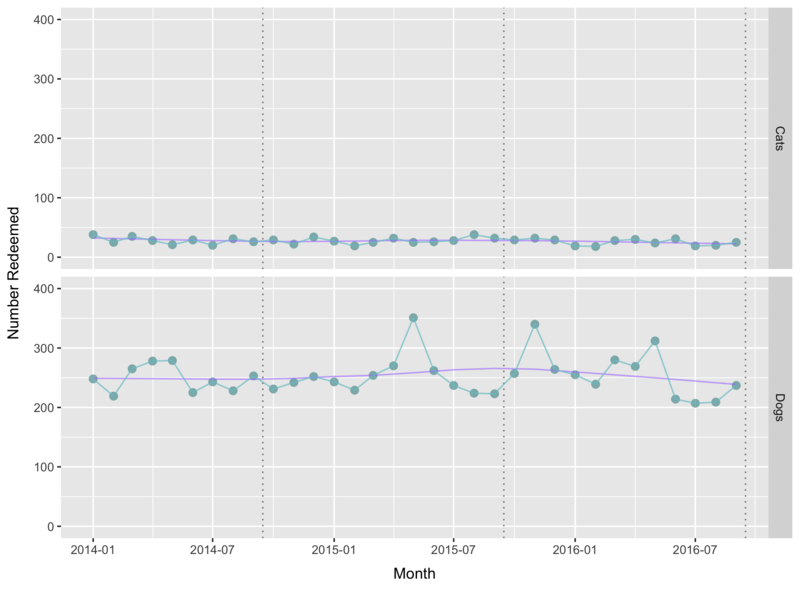 Monthly cat transfer-to-partner volume, like adoption volume, is plainly seasonal and driven by kitten intake. Transfer volume can reach 400 cats in summer months, and fall as low as 40 in winter. 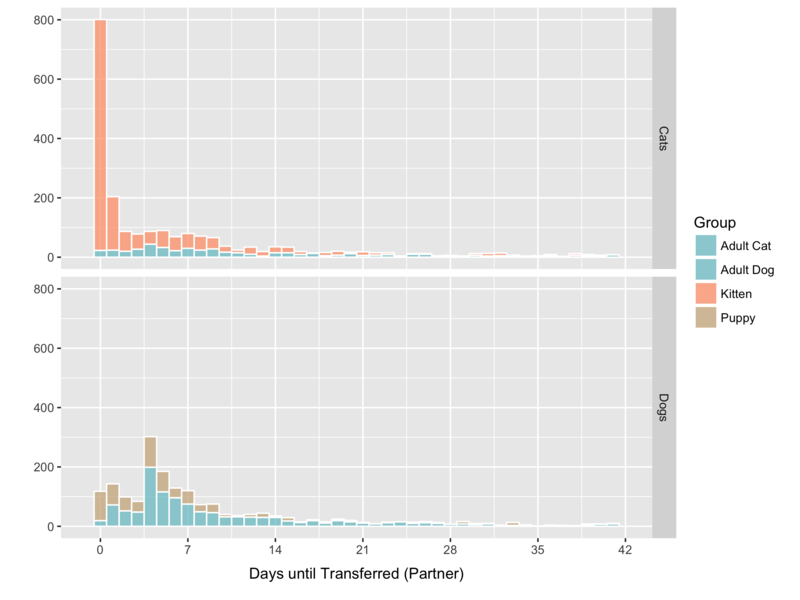 Dog transfer-to-partner volume averaged 166 dogs per month in the recent cycle. Neonatal kittens constituted 85% of all kittens transferred to partner organizations in the recent cycle. Neonatal transfers happen quickly. For neonatal kittens that were transferred to partners, over half left the shelter on the day of intake (versus about one week for weaned kittens), and three quarters left by day four. Adult dogs and cats were transferred to partner organizations less rapidly than kittens and puppies. 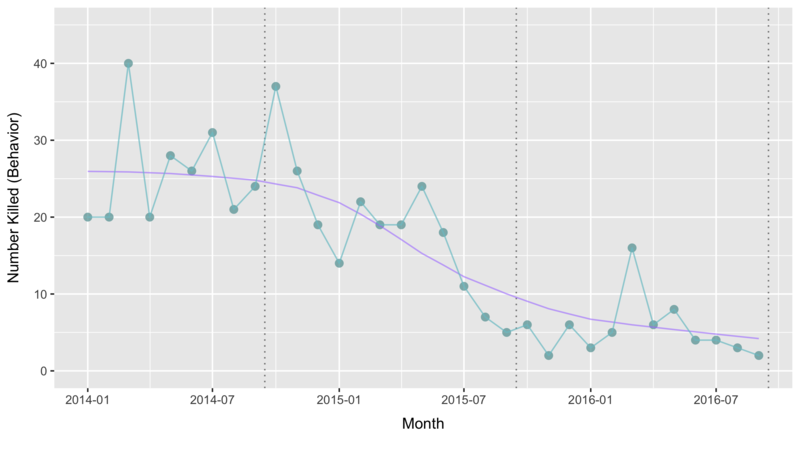 Still, the median time until transfer for an adult dog or cat was well under two weeks, and there was relatively little transfer activity after one month. If not redeemed by their owners, dogs labeled “Pit Bull” lingered in the shelter before being transferred to partner organizations or adopted. It took over three weeks for half the transferred dogs to exit the shelter, and two months for three-quarters to exit, versus ten days and three weeks, respectively, for other top breed labels. Cats entering the Stray Cat Return Program are transferred to the Austin Humane Society to be sterilized and then released back to the location where they were originally captured. The SCRP is not a feral cat trap-neuter-return program, as temperament and behavior are not factors in qualifying cats. Many tame pet cats enter the program. Cats qualify based on health and age and the absence of discrete disqualifying factors, like being declawed or having a known history of life as an indoor cat. Likewise, the SCRP is not exactly a community cat program, as released stray cats are expected to soon reunite with their actual owners, “usually going back to their owner’s front porch.” While this assertion may in fact be true, we should note that there is no research on the experience of cats in this particular program, and therefore, at this point, any belief about precisely what happens is based on faith more than on knowledge. 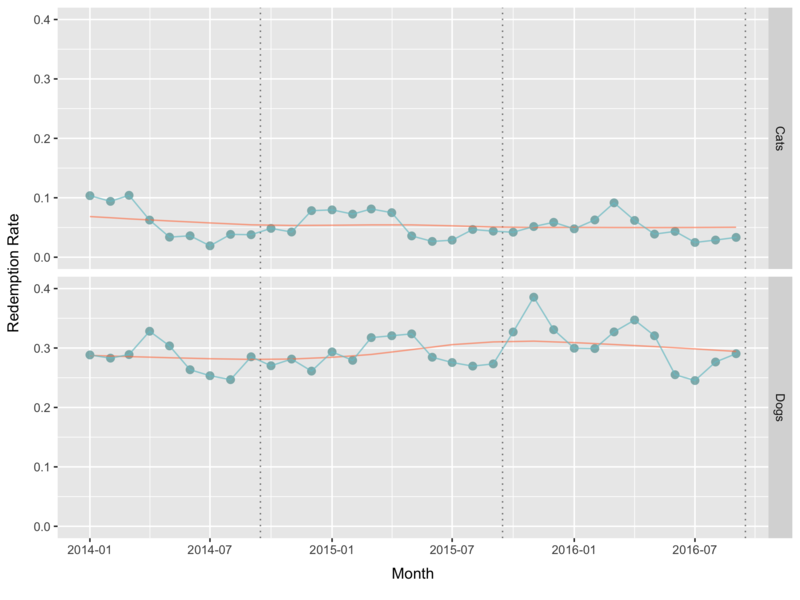 In the recent cycle, about 800 cats were transferred to the SCRP, which was 251 fewer cats than in the prior cycle, for an overall transfer rate of 4.8%. Adult cats made up 70% of the transfers. Only five percent of kittens left the shelter through the SCRP program, versus about one quarter of adult cats, as mentioned previously. On average, 66 cats were transferred per month. Stray cats and dogs are entitled by law to a holding period, so that their owners may find them and redeem them. Stray cats that qualify for the SCRP are either housed at AAC and transferred once the stray-hold period has elapsed, or transferred to the Austin Humane Society on the day after intake and housed there during the stray-hold period. 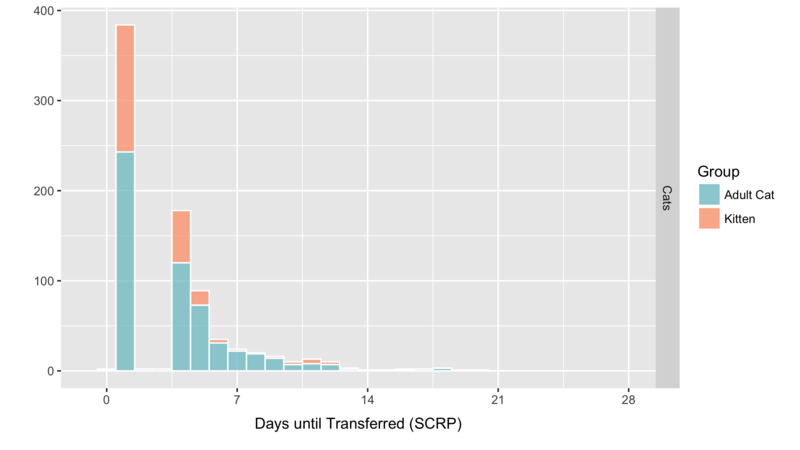 Ninety percent of SCRP transfers were completed within the first week and nearly all were completed within two weeks. The next and final outcome type we will look at is death by lethal injection. Killing of this sort can be classified as either euthanasia, undertaken as a last resort and solely to serve the interest of an irremediably suffering animal, or non-euthanasia, undertaken to serve a wider spectrum of interests. Clearly the only circumstance in which death through euthanasia can serve the interest of the animal itself is when the animal’s experience of life has degraded to such a desperate point that the essence of what we all know makes life precious and desirable has vanished, and there is no hope for recovery. The principal author of California’s Hayden Act, which regulates the state’s animal shelters, has described an animal qualified for euthanasia as one “actively in the throes of intense suffering from a medical problem so severe that their suffering cannot be alleviated.” Similarly, the No Kill Advocacy Center has stated that euthanasia is supportable only when an animal is suffering from severe, unremitting pain that is beyond medicine’s ability to care for or manage despite prompt, necessary, and comprehensive medical intervention. For pioneering shelters with already high life-saving rates, the goal is becoming reachable, and there has never been a more exciting or promising time in the history of animal sheltering in America. With this context in mind, we now turn to examine the remaining cats and dogs still being killed at the Austin Animal Center. Overall, killing of cats and dogs at AAC is low compared to most other animal shelters in the country. In the recent cycle, 442 cats and dogs were killed, amounting to 2.63% of all cats and dogs discharged. For medical reasons, when the cat or dogs is believed to be gravely sick or injured. For behavior, when the cat or dog is believed to exhibit unmanageable and hazardously aggressive behaviors. For rabies risk, when the cat or dog is believed to pose a risk of rabies transmission. We will look at each of these categories in the upcoming sections. As shown below, in the recent cycle most killing of cats was for medical reasons, accounting for 90% of the cats killed. Most of the killing of dogs was for medical reasons as well, accounting for a little over half of the dogs killed. Another third were killed for behavior. In the recent cycle, 224 cats and 104 dogs were killed for medical reasons, for an overall kill rate of 2%. As summarized below, adult cats were disproportionately represented, accounting for 37% of the medical-justified killing but only 14% of the cats and dogs leaving the shelter. The opposite held for all dogs, which were proportionally underrepresented. 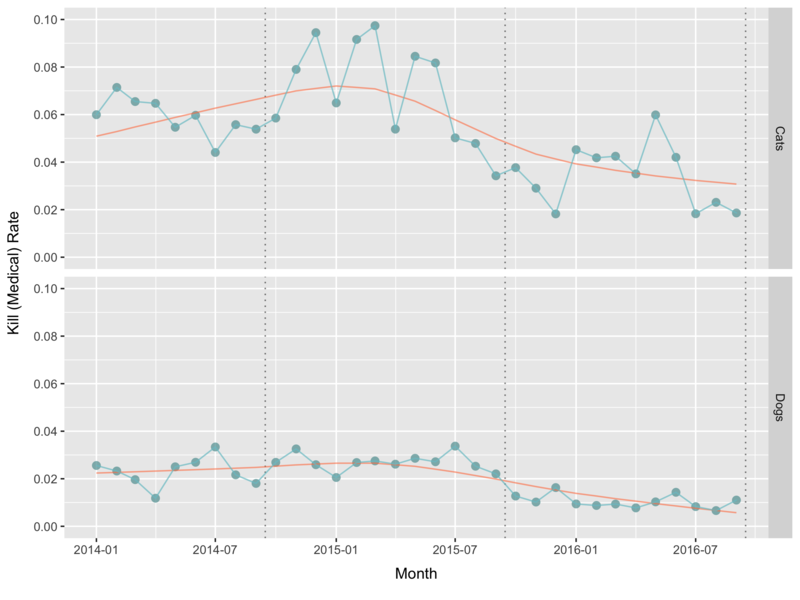 In the recent cycle, 244 fewer cats and 179 fewer dogs were killed for medical reasons than in the prior cycle. The rate of killing was more than cut in half for puppies, adult dogs, and adult cats, and nearly cut in half for kittens. 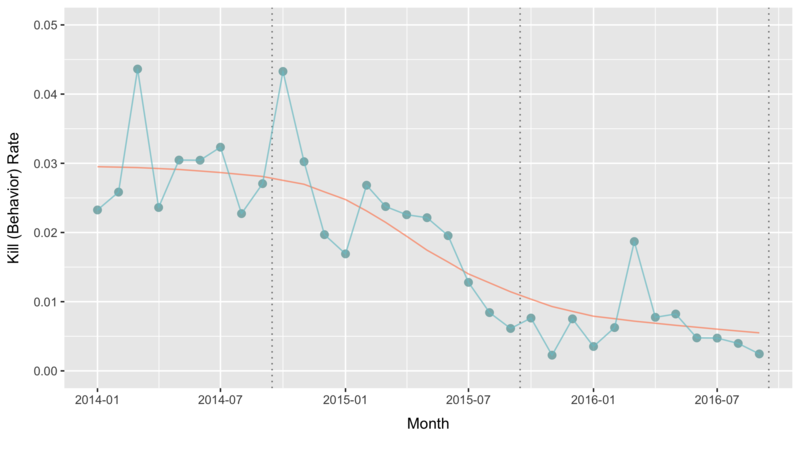 Monthly killing of cats for medical reasons is slightly higher in the early summer, a seasonal effect that is driven by the intake of kittens. In the recent cycle, on average ten cats, nine kittens, seven dogs, and two puppies were killed per month for medical reasons. 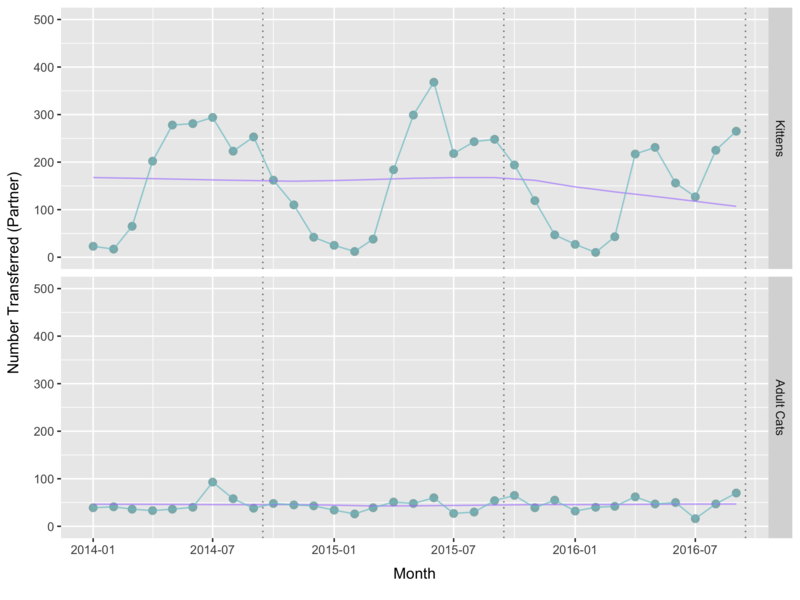 All medical-justified killing was trending down. 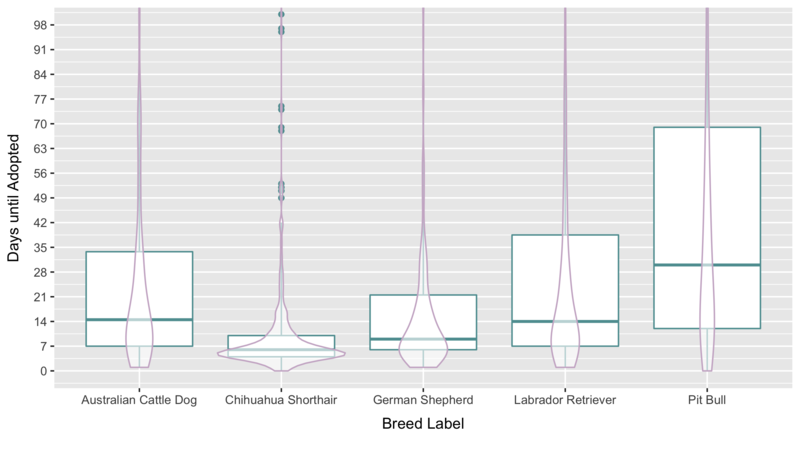 Across the top dog breed labels, the recent cycle saw killing for medical reasons reduced to nearly one third of what it was in the prior cycle. 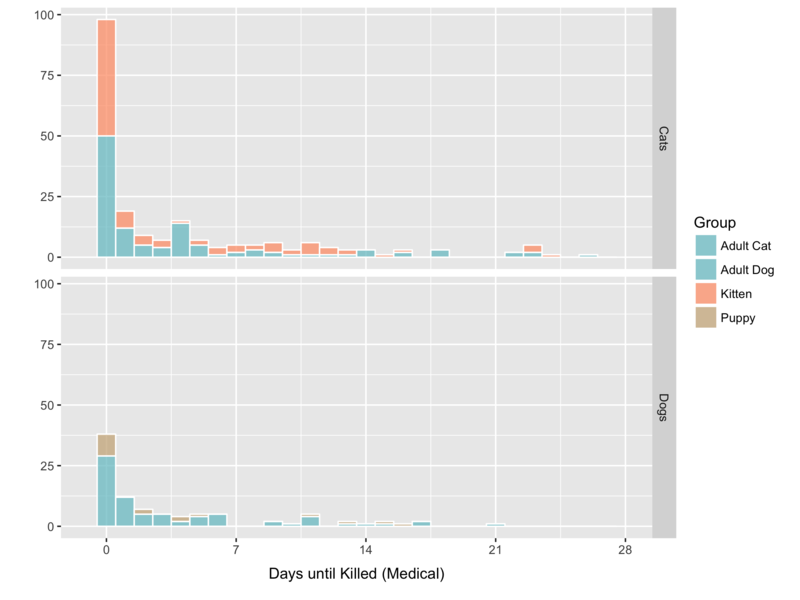 Most killing for medical reasons happened early, near the day of intake, after which the frequency of medical-justified killings tapered off into a long tail. By merely looking at the numbers we cannot gauge whether all the medical-justified killings met the definition of genuine euthanasia. Current thinking says that euthanasia is warranted for less than one percent of all animals entering a shelter, because of modern veterinary science and ways to preserve quality of life through palliative and hospice care. [12, 13] By that measure, there is room to reduce even further the number of animals killed for medical reasons. Regardless, medical-justified killing at every shelter deserves to be continually regulated, audited, and reevaluated with the goal of permitting only actual euthanasia in the context of the current state of the art of care. 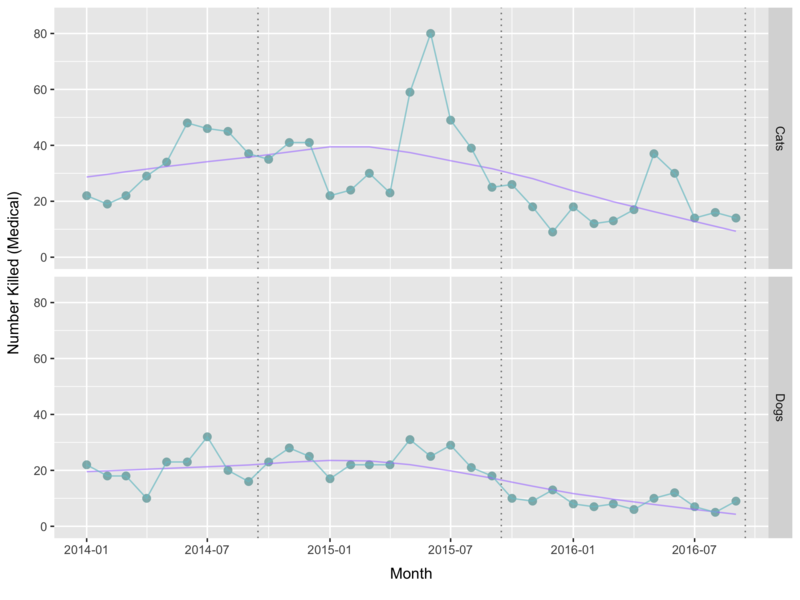 In the recent cycle, 65 dogs were killed because of behavior, which was 156 fewer dogs than in the prior cycle, a striking reduction. On average, five dogs were killed per month, versus eighteen dogs per month in the prior cycle. 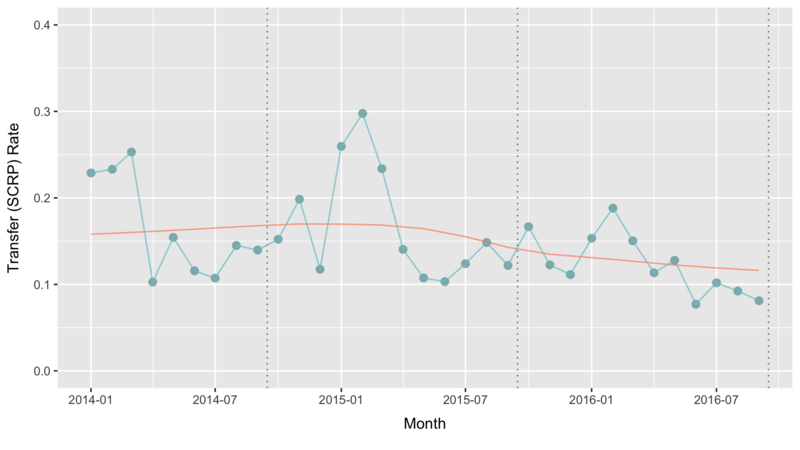 In the summer of 2015 killing for behavior dropped sharply from double digits into single digits, where it stayed for the duration of the recent cycle, with one exception. 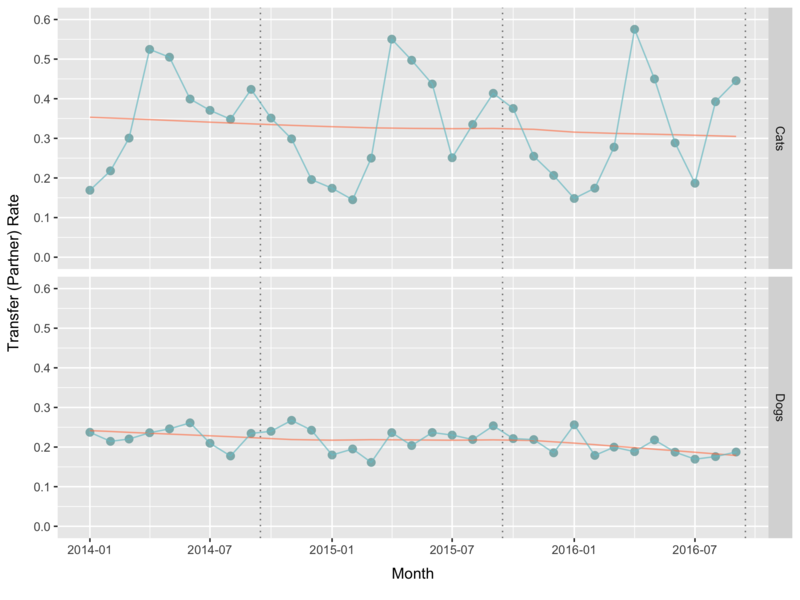 There was a spike in killing for behavior in March of 2016, followed by a resumption of the downward trend. The 65 dogs killed for behavior in the recent cycle were all adults and had eighteen breed labels. The label “Pit Bull” was disproportionately represented, making up 46% of the dogs killed for behavior, but only 16% of the shelter population of dogs. 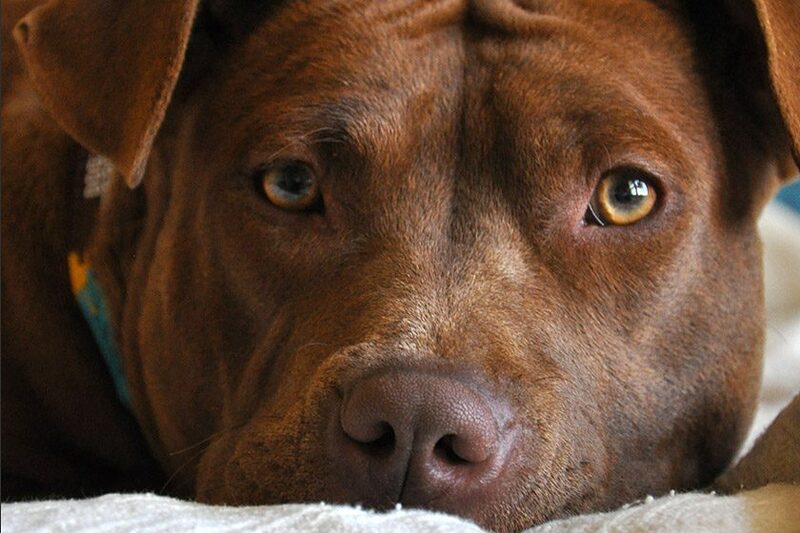 Nevertheless, the killing of dogs labeled “Pit Bull” for behavior was reduced dramatically. In the prior cycle, 8% of dogs labeled “Pit Bull” were killed for behavior, but in the current cycle that fell to 2%. 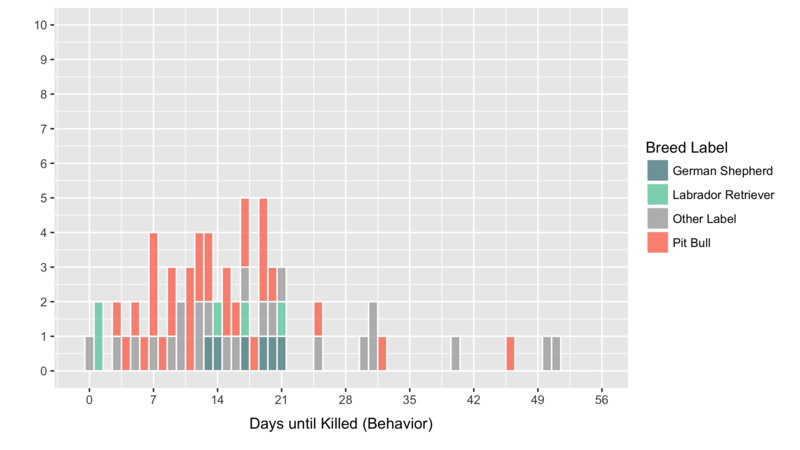 The median time until a dog was killed for behavior was two weeks, and three quarters of all dogs killed for behavior were killed within three weeks. The No Kill Advocacy Center argues that appreciably less than one percent of dogs with worrisome behaviors are beyond our current ability to rehabilitate, pointing to recent studies and to the beliefs of practiced shelter directors. 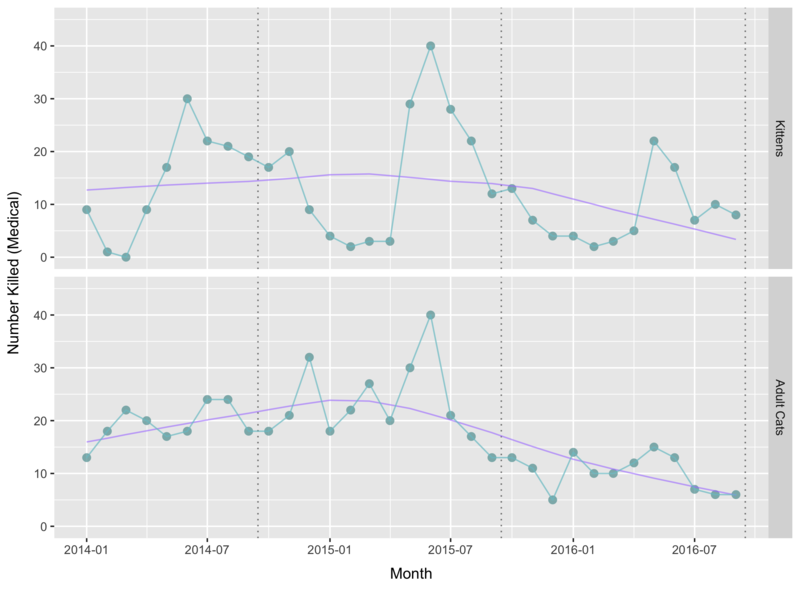 Though the average for the recent cycle was five dogs killed for behavior per month, the recent quarter (ending September 2016) has seen only three dogs killed per month, which is a rate of 0.5%. Barring further setbacks, like the March 2016 spike, this level of performance puts AAC tantalizingly close to eliminating behavior-justified killing of otherwise healthy dogs, a remarkable and compelling prospect. People, cats, and dogs acquire the rabies virus from the bite of an infected animal. While it is feasible for the virus to spread from the wet saliva of a rabid animal to an open wound, or to the eyes, nose, or mouth, incidents are exceptionally rare and undocumented, especially with respect to companion animals. The virus cannot be transmitted through contact with the fur, blood, urine, or feces of a sick animal. Once introduced, the virus incubates for a long time as it travels slowly through nerve fibers to the brain, and at the same time to the salivary glands. This period in cats and dogs is generally three to twelve weeks. Infected cats and dogs start salivary shedding of the rabies virus a few days prior to the onset of clinical symptoms. For all mammals, once clinical signs appear the disease is fatal and the progression to death is swift. Cats and dogs in Texas that bite a person are held in quarantine and observed for ten days. [14, 15] If no rabies symptoms develop, then the cat or dog could not have been shedding virus at the time of the bite. Diagnosis of rabies in cats, dogs, and wild animals is made by sampling brain tissue, which can only be done after sacrificing the animal. The head is removed, refrigerated, and sent to a specialty laboratory for testing. Bats and skunks are the primary reservoirs for rabies in Texas. In Travis County bats account for most all of the laboratory-confirmed cases (101 of the 104 confirmed cases in 2015). By contrast, in the past ten years, one dog and one cat in Travis County have tested positive for rabies, out of the 3,371 cats and dogs whose heads were sent to the Texas Department of State Health Services (DSHS) laboratory. 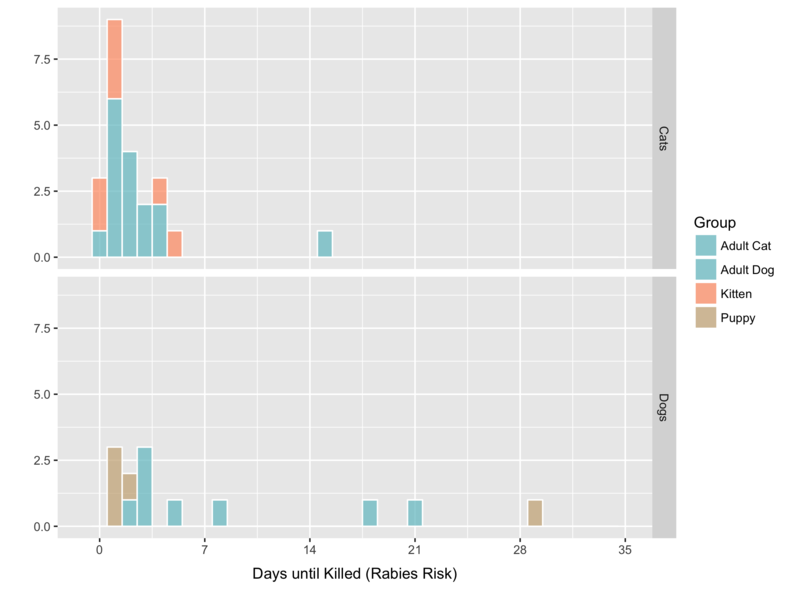 In the recent cycle, 23 cats and 14 dogs were killed for rabies risk. From the data alone it is not possible to know how risk is assessed, whether it derives from the presence of known or suspected wild-animal bites or from the emergence of troubling clinical symptoms. Regardless, in the recent cycle, no cat or dog specimen sent to DSHS from Travis County tested positive for rabies, presumably including the 37 cats and dogs killed at AAC. Therefore, we can safely say that whatever criteria is being used, the sensitivity is low. 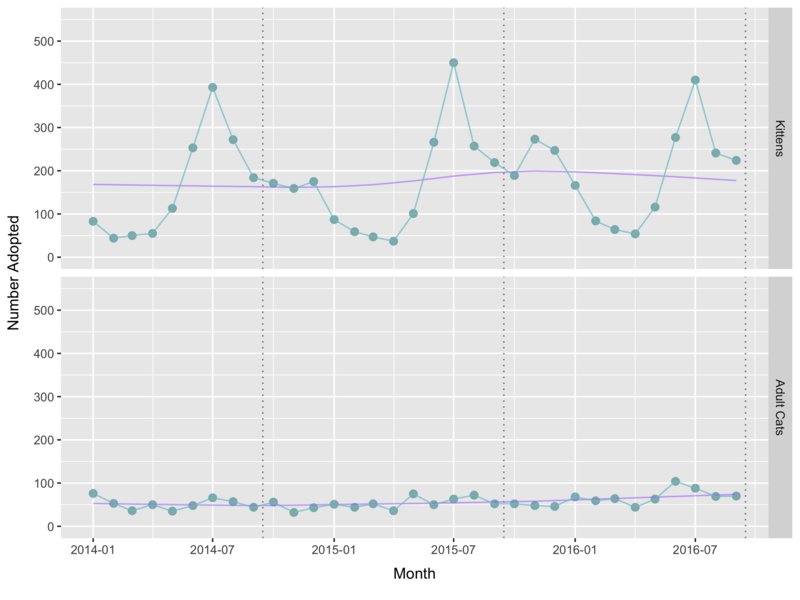 On average, two cats and one dog were killed for rabies risk each month in the recent cycle. Fewer adult dogs and fewer dogs labeled “Pit Bull” were killed for rabies risk during the recent cycle. Most cats and dogs killed for rabies risk were killed within the first week, but a few dogs were killed after several weeks in the shelter. The Center for Disease Control reports that less than one percent of domestic animals sacrificed and tested in the United States are positive for rabies. The positive rate for tested cats and dogs in Travis County over the past decade has been 0.06%. In Travis County and surrounding counties (Bastrop, Blanco, Burnet, Caldwell, Hays, Lee, and Williamson) the rate over the past decade has been 0.26%. Though rabies poses a very real and serious public health issue, a person whose much loved cat or dog was exposed to or bitten by a wild animal would be understandably loath to have their companion killed, and possibly its head removed for assessment, knowing the low probability that rabies had actually been transmitted. The law in Texas recognizes this state of affairs, and permits post-exposure prophylaxis (PEP) in lieu of killing a cat or dog exposed to rabies. [17, 18] Under the Texas PEP protocol, an exposed cat or dog is re-vaccinated, one or more times, and held in isolation from other animals and people, except for contact necessary for its care, for either 45 or 90 days, depending on whether it was currently vaccinated. Texas law lags behind the current science and the recommendations of the National Association of State Public Health Veterinarians, which support PEP protocols that feature shorter and less strict observation periods when immunization is out of date. [19, 20] Nevertheless, Texas does at least provide a workable statutory framework for preserving the lives of cats and dogs exposed to rabies. Texas Administrative Code (TAC) Chapter 169 sets uniform rules for rabies control, which local governments may adopt or make more stringent. Travis County has directly adopted the PEP protocols specified in the TAC. The City of Austin, on the other hand, has an old ordinance on the books mandating an obsolete PEP protocol based on a six-month isolation period for all cats and dogs exposed to rabies, regardless of vaccination status. The forced choice between lethal injection or a six-month quarantine makes it unnecessarily hard to preserve the lives of exposed cats and dogs, both for AAC and for city residents. The most perilous thing that can happen to an American cat or dog is to become separated from their person and end up in The System of animal control and animal shelters. Even in forward-thinking cities like Austin, animals entering the sheltering system can end up dead when their situation, through no fault of their own, places them in conflict with competing and worthy interests like public safety. For those who love animals and want to protect them from harm, there is no getting around the truth that the sheltering system continues to kill animals for reasons that are unconnected to what is best for the animals themselves, using injurious means to achieve desired ends. The No Kill Advocacy Center has set the uplifting goal of ending non-euthanasia killing, challenging progressive animal shelters to pioneer new ways of serving all their stakeholders without accepting harm to animals as the collateral cost, and arguing that a better and ethically consistent future in animal sheltering rests on the self-evident principle that the animals still being killed matter just as much as those who no longer face death. As the data presented here show, the Austin Animal Center, with new management and with the steadfast help of Austin Pets Alive! and other partners, has already reduced non-euthanasia killing to a small number. Astonishingly, the ambitious goal set by the No Kill Advocacy Center is actually within sight for the City of Austin. With committed leadership and support, and steady innovation, Austin Animal Center is positioned to forever change the face of animal sheltering and become the very first high-volume metropolitan shelter that is exclusively a place of safety. Photo Olive says, “People beds are nice…” by Eileen McFall is licensed under CC BY-NC 2.0, cropped from original. Diaz, Joy. 2015. City’s New Animal Services Officer on How to Increase Adoptions and Keep Austin No-Kill. National Public Radio KUT Austin. Austin Code of Ordinances Section 3.1.25(c). Potter, Kristen. 2006. 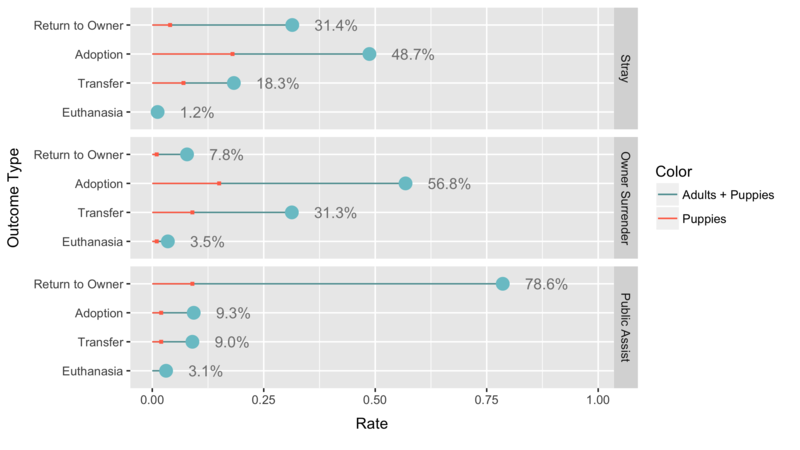 Methods for Presenting Statistical Information: The Box Plot. Visualization of Large and Unstructured Data Sets, Lecture Notes in Informatics S-4: 97-106. Iyengar, Sheena S. and Mark R. Lepper. 2000. When Choice is Demotivating: Can One Desire Too Much of a Good Thing? Journal of Personality and Social Psychology 79, no. 6: 995-1006. Austin Pets Alive! 2015. Austin’s Progress. Austin Pets Alive! 2015. Asilomar Advanced Animal Statistics. Craig, Jordan and Jennifer Smith. 2015. Austin Animal Services Stray Cat Return Program. American Pets Alive! No Kill Conference. February 2015. Bryant, Taimie L. 2008. Sacrificing the Sacrifice of Animals: Legal Personhood for Animals, the Status of Animals as Property, and the Presumed Primacy of Humans. Rutgers Law Journal 39. no. 247: 247-330. No Kill Advocacy Center. 2016. What Shelters Owe Traumatized Animals. No Kill Advocacy Center. 2016. Defining No Kill. No Kill Advocacy Center. 2016. Behaviorally Challenged Dogs: Can We Save Them All? No Kill Advocacy Center. 2016. A Lifesaving Matrix. Texas Health and Safety Code Section 826.042. Texas Administrative Code Section 169.27. Texas Department of State Health Services. 2016. Rabies Surveillance in Texas. Wilson, Pamela, Ernest Oertli, Patrick Hunt, and Thomas Sidwa. 2010. Evaluation of Postexposure Rabies Prophylaxis Protocol for Domestic Animals in Texas: 2000-2009. Journal of the American Veterinary Medical Association 237 (December). no. 12: 1395-1401. Brown, Catherine, Sally Slavinski, Paul Attested, Tom Sidwa, and Faye Sorhage. 2016. Compendium of Animal Rabies Prevention and Control, 2016. Journal of the American Veterinary Medical Association 248 (May). no. 5: 505-517. Moore, Michael, Rolan Davis, Qing Kang, Christopher Vahl, Ryan Wallace, Cathleen Hanlon, and Derek Mosier. 2015. 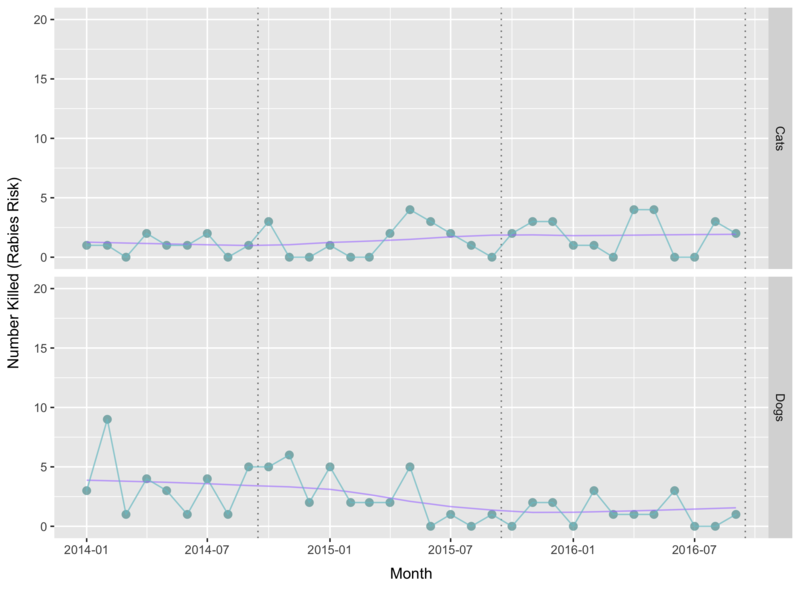 Comparison of Anamnestic Responses to Rabies Vaccination in Dogs and Cats with Current and Out-of-Date Vaccination Status. Journal of the American Veterinary Medical Association 246 (February). no. 2: 205-211. Texas Health and Safety Code Section 826.014. Travis County Code Section 52.010. Austin Code of Ordinances Section 3.3.5(b). Thank you for all this excellent data. Do the pit bull figures above also include pit bull mixes (as primary or secondary breed)? Do you have the mean length of stay for adopted pit bulls?